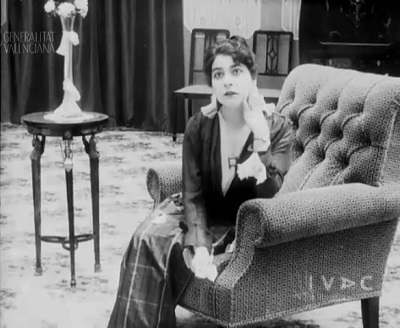 Xirgu on film: Alma Torturada | Tortured Soul (ES 1916) | Silents, Please! I first became interested in Margarita Xirgu a year or two ago, when I saw a performance of the opera Ainadamar (‘Fountain of Tears’, 2003). The opera centers on the relationship between the poet Federico García Lorca and the actress Xirgu, his close friend, muse, and champion of his work over the years and from the distance of exile. Ainadamar is told in a non-linear fashion and covers the intertwined lives of García Lorca and Xirgu, until his murder in 1936 and her death in 1969. His play Mariana Pineda is a key theme in the opera, becoming a kind of mise en abyme: the opera makes a parallel between the life stories of García Lorca and the historical figure of Mariana Pineda, and Xirgu as survivor, as she prepares to perform the role one last time, more than forty years after she premièred it. It’s an ambitious premise, and one that I thought the production delivered on: emotionally resonant, musically creative, fantastic staging, beautiful and brutal; I highly recommend it. (Incidentally, the cast of the opera is all female, García Lorca being a trouser role in Ainamadar). Margarita Xirgu was a leading theatre actress of her time who had her own production company and collaborated often with García Lorca. Indeed, she was responsible for premièring La casa de Bernarda Alba | The House of Bernarda Alba in Buenos Aires in 1945, almost a decade after it was written. 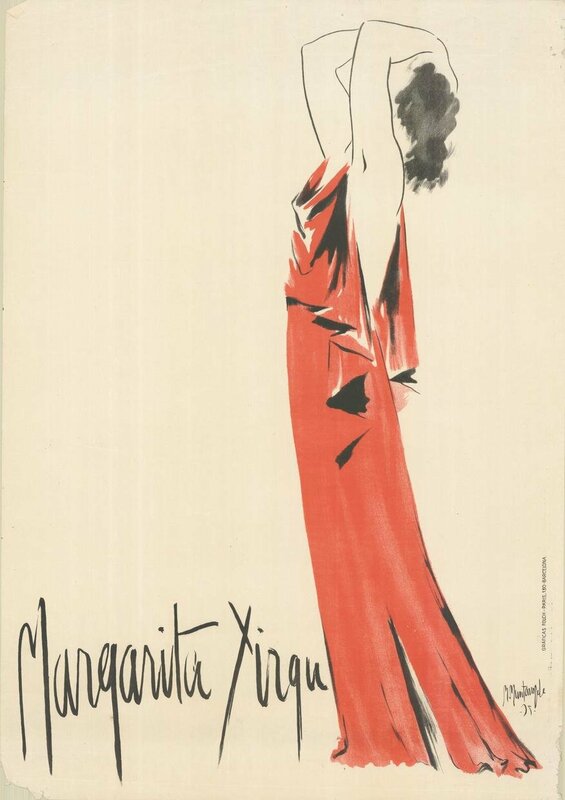 Though mostly famed for her stage work, Xirgu also acted in moving pictures, all but one of which were silent films. The major corpus of her cinema work is the five films she made for Barcinógrafo in 1915 and 1916. I was thrilled to see that the latter three of these films have been digitized and made available online by IVAC, the Valencian Institute for Audiovisual and Cinematography: La reina joven | The Young Queen (ES 1916), El beso de la muerte | The Kiss of Death (ES 1916), and Alma Torturada | Tortured Soul (ES 1916). (El amor hace justicia appears to be lost, while El nocturno de Chopin reportedly survives in Valencia, but has not been digitized and made available alongside the other films). It is Alma Torturada that I’ll focus on in this post. In Alma Torturada, Xirgu plays Emilia, a woman whose happy life is disturbed when her brother Augusto is accused of killing a prostitute and consequently is sentenced to prison. The news is delivered to her via a letter sent by a doctor, Morales, who Augusto has asked for help. However, Emilia’s husband Villalba is convinced of Augusto’s guilt and refuses to help, and Morales’ hands are somewhat tied, since he had once tried to woo Emilia. Some time later, Augusto escapes and visits Emilia, climbing into her room through the window to tell her that he is leaving the country. “I know that your husband denounced me and I entered so as not to be seen. I am leaving for abroad, but first I wanted to embrace you.” Villalba hears voices and becomes suspicious; thinking quickly, Emilia pretends to have been robbed and misdirects the pursuers. Suspecting this man to be her lover and the robbery story to have been a ruse, Villalba decides to break off their marriage. Although they will continue to live together for appearance’s sake, “there is forever a wall between our souls”. Meanwhile, Doctor Morales has been busy. Having helped Augusto flee, he now approaches Lucía, the maidservant of the murdered woman (evidently, she was the fancy kind of prostitute). Due to what she witnessed, Lucía is traumatised and unreceptive, initially telling the doctor that she knows nothing (“no se nada!”); hearing this, Emilia despairs. Eventually, however, Lucía reveals the truth about the murder to Morales. But the reveal will have to wait! Villalba’s jealousy grows; he searches Emilia’s desk and follows her to meet Morales, who he challenges to a duel (Emilia does not initially know about this). Augusto comes to see Emilia with a letter in which the statement of Lucía proves that the murderer was in fact … Villalba! Suddenly, his rather harsh repudiation of Augusto makes sense. Emilia and Augusto arrive just before the duel is to take place, and accuse Villalba of the murder – “A murderer cannot fight with a gentleman!” The truth laid bare, Villalba commits suicide. At the end of the picture, Emilia falls into Morales’ arms, “the man who took his love to the extreme of risking his life for her”. To me, Alma Torturada resembles Italian diva films more than Hollywood production of the time; since many diva films were imported into Spain in the teens, it’s reasonable to assume that they were an influence on Barcinógrafo’s production. 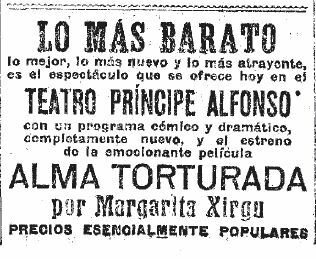 (For those interested, my post on Pasionaria gives more background on the early film industry of Spain). Although the plot is more balanced between the different characters than in some diva films, it’s certainly a vehicle for Margarita Xirgu. I must say that while agreeable, I didn’t find her to have the screen charisma that I hoped for; no doubt she was a great stage actress, but she was unable to channel her talent on camera. Some moments were delightful – a hand gesture, a tilt of the head, as in the left-hand picture below – but all in all, I didn’t fall in love the way I expected to. Emilia disdains Villalba; imploring him not to duel with Morales. I did, however, fall in love with this hat! A very strong entry into the parade of wonderful/crazy 1910s hats. And one must always appreciate a good eye-roll, as here in this conversation between Emilia and Villalba. Alma Torturada was restored in 1996 from three screening copies: one held by the Filmoteca de la Generalitat Valencia, and two at the Filmoteca Española. The two film copies at the Filmoteca Española were produced in the 1960s from the original negatives – unfortunately, they were printed with a sound gate, meaning that a section of the image area is missing. (I’ve cropped this out in my screenshots, but the keen-eyed reader will notice that some of my images are squarer than others, with the Generalitat Valencia logo closer to the left edge of the frame; this is why). The Filmoteca de la Generalitat Valencia copy is an original (full-frame) toned and tinted nitrate print; it provided the basis of the narrative reconstruction. (Since most film in the silent era was pos-cut – necessary, when different shots were tinted and toned differently – the negative would not have been edited/neg-matched in the way that later became conventional). Damaged sections of the film were replaced by the same sequences from other copies, and it was therefore necessary to correct for contrast, density, etc; colouring was recreated in the black-and-white material. Also, some missing intertitles were recreated, using a different typeface to indicate that they were not original. Quite an involved restoration project! 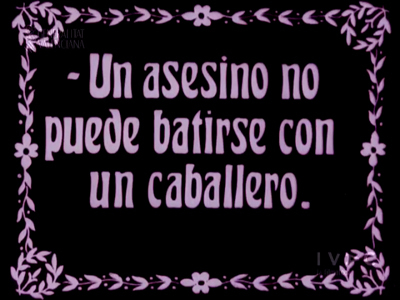 This intertitle style only appears a handful of times in Alma Torturada, but is used through El beso de la muerte. There is not much information available online about Alma Torturada, apart from what is written on the webpage of IVAC. 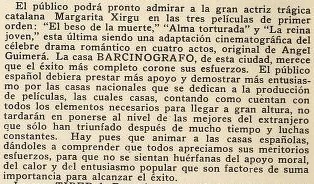 They state that on 08 June 1916, Barcinógrafo announced the production of two more films with Margarita Xirgu, but that filming was postponed for several months due to Xirgu falling ill. These last two films, Alma Torturada and La reina joven were released to excitement. Clearly the first three Xirgu films were financially successful, and it is indicated that the latter two films also found success. Looking around at various digitized materials online, I’ve found a few more fragments of Alma Torturada‘s history. This allows me to establish that the film was released in December 1916, and that it continued to be shown during at least the first half of 1917 in Spain. Spanish newspapers can be searched via the excellent resource Hemoeroteca Digital, a service of the National Library of Spain. 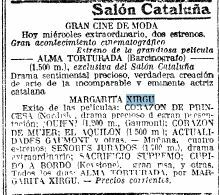 From this we can see that La Vanguardia, Barcelona’s main newspaper, ran listings for the film in December 1916 and January 1917. 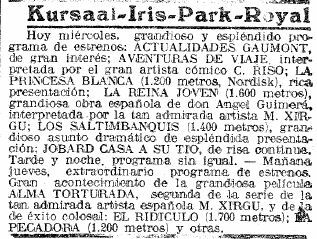 Alma Torturada and played at the Salón Cataluña in December; in January the film was showing at the Kursaal-Iris-Park-Royal and the Diana-Excelsior-Argentina. La Vanguardia, 20 Dec 1916 and 10 Jan 1917. 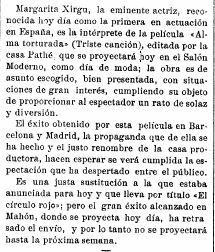 El Imparcial, 18 Feb 1917. Two variations of this advert were published on the same page. El Imparcial, 20 Feb 1917. For context, on the same page are brief items on a range of films and stars, including Mistinguett, Pina Menichelli (in Mecha de oro), Suzanne Grandais, Cabiria, Valdemar Psilander, and Gustavo Serena. So there you have it! Some more information about this film that is little-known, but an important part of early Spanish film history. Alma Torturada [Tortured Soul]. Dir. Magí Murià. Barcelona, Spain: Barcinógrafo Films, 1916. Joint restoration of the Filmoteca Española and the Filmoteca de la Generalitat Valencia (i.e., IVAC CulturArts). Available to watch here on IVAC CulturArts’ Vimeo channel. This entry was posted in Film and tagged cinema of 1916, cinema of Spain, EFG, excellent women, forgotten film stars, Magí Murià, Margarita Xirgu, original research. Bookmark the permalink.